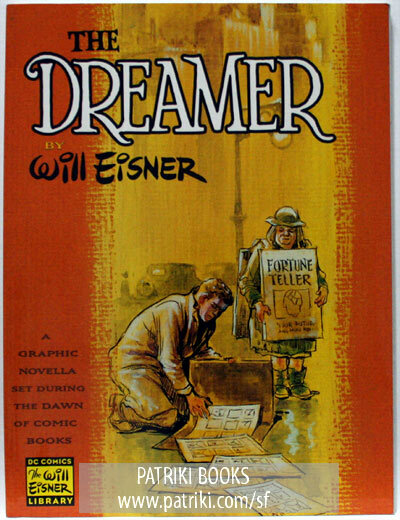 Today's influential writer is Will Eisner! I once named Will Eisner number 2 on the list of the most influential comics artists, and certainly number 1 on the list of the most influential American comics artists. For so many of the same reasons, he is number 6 here. Eisner stood out in the Golden Age as a guy who wrote comics for adults, not just kids (not that kids couldn't enjoy them). 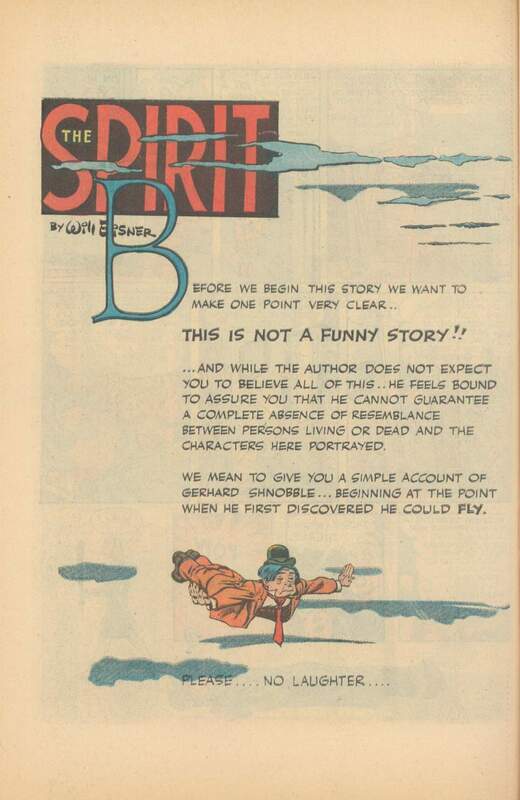 Unlike pretty much all the other superheroes at the time, Eisner's protagonist, The Spirit, was flawed: he could be beaten up, he could be beaten, he could be outwitted, and his heart could be broken. This kind of vulnerability was essential to the developments in comics that would take place later on. Eisner also got that sometimes, it was best for the heroes to stay out of the way, while some other supporting character took center stage. The story of Gerhard Shnobble, for one, is very touching. More so, Eisner also stood out as actually being one who put a significant amount of effort into his scripting. 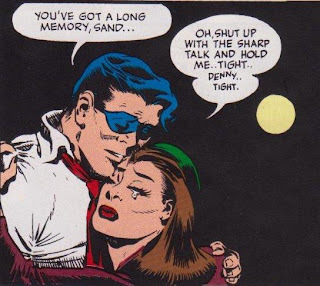 While narration boxes mostly consisted of a parsimonious dissemination of plot points ("Meanwhile, back at the ranch..."), Eisner's prose was poetic, capturing the tone and drama that was required of the story. 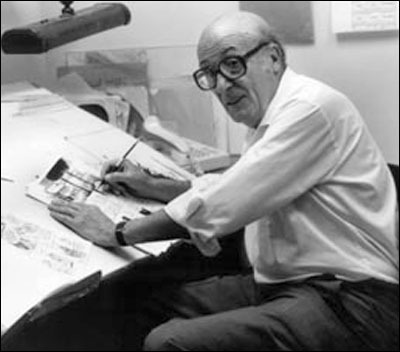 Later on in the 1970s, Will Eisner pioneered the "graphic novel" with A CONTRACT WITH GOD, a short story book about personal relationships and down-to-earth characters. 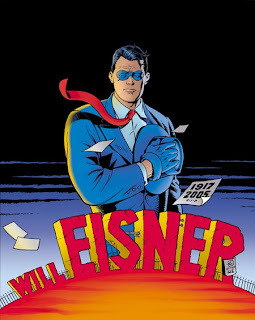 Without Eisner, it's a strong possibility that the graphic novel would not have existed yet, or would not command much of the respect that it currently does. For really being the first comics artist to use the concept of a flawed hero and utilize the written word to the advantage of the comics, and for kickstarting the graphic novel movement and the ability to write about personal matters, Will Eisner is number 6. 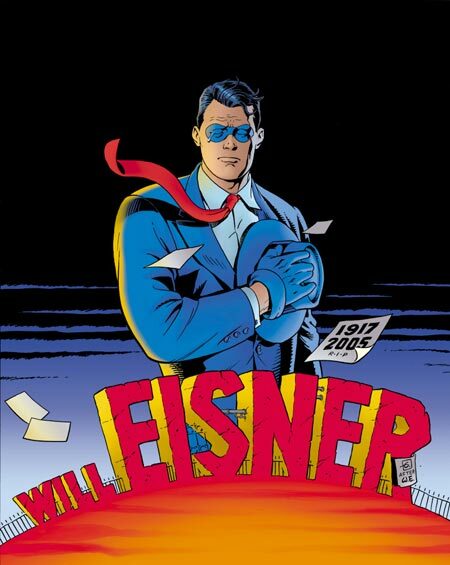 Comics' Eisner Awards are named after him. According to Alan Moore, Will Eisner is the man most responsible "for giving comics its brains." 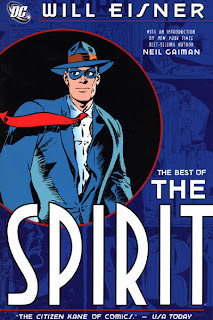 Neil Gaiman has also admitted that when he stopped reading comics, he made an exception for THE SPIRIT. The works of these two, among others, hold Eisner's influence. Other writers or writer/artists admittedly influenced by Will Eisner include Darwyn Cooke, Art Spiegelman, Jack Kirby (who actually worked for Eisner), Michael Chabon, Scott McCloud, Paul Levitz, Scott Shaw!, and Mike Allred. This is covered in COMIC BOOK ARTIST #6, which is a tribute to Will. THE SPIRIT is essential reading for any Will Eisner enthusiast, especially the stuff he did after 1945, when he really cut loose with his stories. 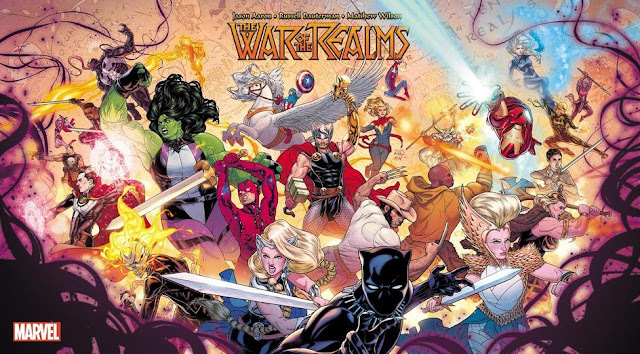 A CONTRACT WITH GOD kickstarted the graphic novel movement, but it's not Will's only GN. 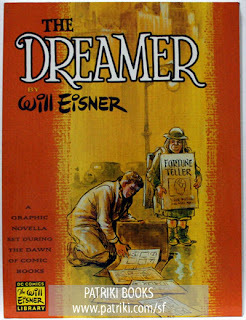 I'll always recommend the DREAMER so you can find out more about Will, since it's basically a fictionalized autobiography. Will's also written some instructional books. 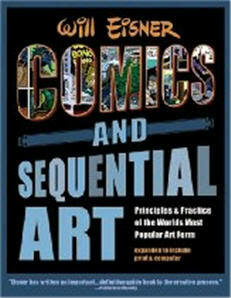 COMICS AND SEQUENTIAL ART is essential reading for anyone who wants to make comics. Who's next on the list? Come back on Monday for the fifth most influential comics writer of all time, same Cube time, same Cube channel! Although I personally put Will Eisner in the top of a list like this, you do make some really good arguments for artists like Harvey Kurtzman. When I did the list of influential writers though, I tried extricating (as much as can possibly be done) Eisner's art from his writing. Although it's an impossible task, the furthest I could go with him as a pure writer was number 6. Basically, if he had written something and someone else had drawn it, would it have been as big? I'm not so sure.